The striker scored the quickest hat-trick in ISL history and also his second in two games. 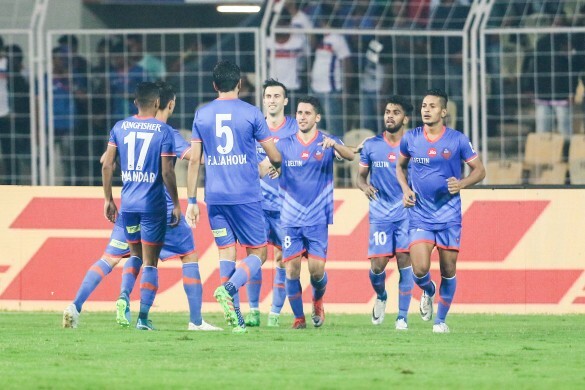 FC Goa utilized their Spanish combination to perfection as they inflicted a 5-2 defeat on Kerala Blasters FC at the Jawaharlal Nehru Stadium in Goa on Saturday. Ferran Corominas bagged his second successive and the league’s fastest-ever hat-trick, while fellow Spaniard Manuel Lanzarote bagged a brace for the Gaurs. Mark Sifneos and Jackichand Singh scored the goals for the visitors. To begin with, the game started on a sour note for the Blasters as they lost Dimitar Berbatov to an injury as early as the third minute. Both teams looked to take the attack to their opponents and two goals came in quick succession. First, from a Kerala attack in the seventh minute, Jackichand found Sifneos with a delightful cross from the right. The Dutchman brought it down, and although his shot was not clean, Goa custodian Laxmikant Kattimani couldn’t save it as it slipped under his arm and rolled over the goal-line. Next, the home team equalised two minutes later after Edu Bedia split the defence with an incisive pass that Narayan Das picked up. His cross was met with a first-time volley from Lanzarote and although goalkeeper Paul Rachubka got a hand to it, he was beaten for power at the near post. The Gaurs then took the lead in the 18th minute after Rachubka’s attempted clearance was pounced on by Corominas and the ball came to Lanzarote. The Spaniard weaved his way past the defence and calmly placed the ball into the net for his and Goa’s second. Twelve minutes later, Kerala grabbed the equaliser. Substitute Milan Singh put Jackichand through on goal with a deft pass, and he coolly slotted it past Kattimani. Sifneos could have restored the lead for Kerala, but after getting into the box in the 34th minute and facing only Kattimani, he blasted the ball over the goal. Brandon Fernandes in turn could have given Goa the lead in the first half, but his long-distance effort in the first minute of added time just missed the target. That was the last attempt of an entertaining half as the teams went into the break locked at 2-2. Goa wasted no time in taking the lead after the restart as Corominas netted in the 48th minute. Ahmed Jahouh put in a delightful through ball to Corominas, who slotted the ball home through Rachubka’s legs. Two minutes later, Corominas doubled the lead with his second. A penetrating ball from Brandon put him through on goal again, and he chipped the ball over an out-rushing Rachubka. He completed his hat-trick by scoring Goa’s fifth in the 55th minute courtesy of their Spanish combination. Lanzarote put in an inch-perfect pass from the right and Corominas tucked it into the goal with a first-time strike. Goa never for once stopped being relentless after their fifth goal and Mandar Rao Dessai tested Rachubka in the 66th minute with a rasping shot that the Kerala keeper did well to tip over. Four minutes later Lanzarote was unfortunate not to have bagged a hat-trick of his own. He curled a shot from the edge of the box which dipped at the last moment and hit the crossbar with Rachubka being a mere spectator. After that frantic start, the pace of the game evened out, as Goa were content playing the ball amongst themselves. Kerala’s Courage Pekuson hit a powerful shot from near the box five minutes from time, but Kattimani came up with a fine save with his right hand. Kerala still tried to put some respectability to the score and two minutes later Jackichand hit the crossbar with an effort from distant. Following that, the ball was laid off to Pekuson whose first-time shot was blocked by Kattimani. Rachubka though made the save of the match when he stretched himself to the limit to palm away substitute Pronay Halder’s powerful drive from distance deep into injury time. That was the last bit of action as the Gaurs climbed to second position in the table.